For the first time in 108 years, the Chicago Cubs are the World Series Champions and the city is preparing for an epic party to be held less than 36 hours after the Cubs beat the Cleveland Indians in a 10-inning, game 7 battle at Progressive Field. The team buses are scheduled to leave Wrigley Field around 10 a.m. on Friday for a downtown parade and noon rally at Lower Hutchinson Field in Grant Park. The parade is expected to travel from Addison and Sheffield to Pine Grove and likely downtown via Lake Shore drive. The parade downtown is expected to begin at Michigan Avenue at Oak, then south to Ohio Street before moving to Grant Park for the rally. The event is open to the public. For those who love history, Springfield, Illinois should be at the top of your Midwest travel list. 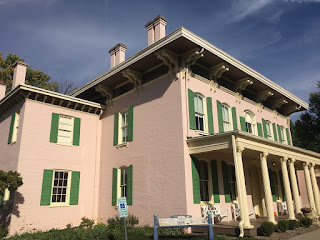 Besides the very obvious reasons of there being a current and former state capitol as well as so many attractions related to Abraham Lincoln, there are several historic homes in the city that give a glimpse into life in Springfield's early days. On a recent visit to Springfield, I was able to visit some of those historic homes, including Edwards Place, which is the oldest home in the city that has remained in the same location. Built in 1833, the home was occupied by Benjamin and Helen Edwards and was a social hub of the area. Benjamin Edwards was the youngest son of Governor Ninian Edwards. The Edwards hosted parties and political events, including a rally for Stephen A. Douglas, which wouldn't seem all that unusual for a prominent family in early Springfield. However, the sister of Edwards' brothers' wife happened to be Mary Todd Lincoln.